Advanced, the last entry on the sidebar, is used for installing apps that require more background knowledge, particularly those that could destabilize the system or make it unusable. A good example is Filesystems, with which you can work on the filesystem. The plugin is used for the creation and editing of mount points and writes directly to the file /etc/fstab. 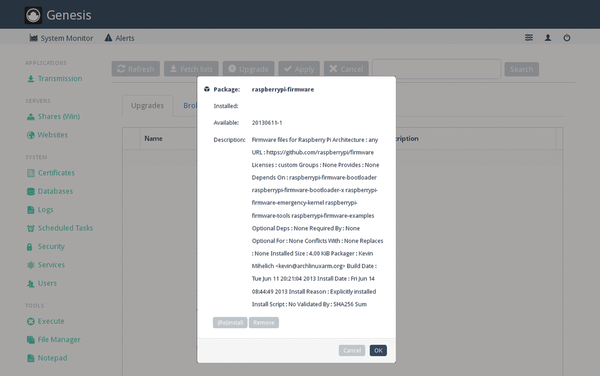 The new Security plugin replaces the Firewall Tables plugin found in previous versions of arkOS. Security contains an automatic firewall and defense system based on fail2ban . The plugin Packages lets you download packages from the arkOS repository and serves as a front end for the package manager Pacman used with Arch (Figure 6). The application System Users permits the management of the IDs and passwords of all users having access to the system, including the root user. System Users allows for the setting of UID and GID, the creation of groups, the assignment of users to groups, as well as the definition of one standard shell per user. Figure 6: It is easiest to update the system via the plugin Packages. Using start and stop, you can start the indicated service and also stop it again. To automatically start an application when the Rasp Pi starts up, you can use enable; whereas disable disables the automatic start. With status, you can display the state of the services and see possible error messages. The command journalctl (no parameters) is also very useful. It shows the complete history of the most recent boot process. You will find additional information for systemd in the systemd wiki . The next release of the arkOS system will be arkOS 0.5. Version 0.5 will provide new features, as well as improvements to existing features. Highlights include a revamped File Manager and file-storage framework, a help subsystem for looking up basic configuration information, and important fixes for the networking plugin. Genesis 0.5 will also support Radicale  , a small CalDAV/CardDAV calendar and contact server. Last but not least, the new arkOS will come with the test version of an email server based on Postfix and Dovecot. This release, tagged for shipping very early in 2014, is supposed to have all core frameworks implemented and will allow the user to configure all basic server functionalities within Genesis. An improved installer will support for more complex installation scenarios with SD cards and USB-attached drives. Looking further into 2014, after a few months of bug testing, security assessment, and polishing, a stable Genesis 1.0 will likely integrate plugins for Tent , XMPP , and pump.io . Ongoing work on the inclusion of the BitTorrent client Deluge  is also underway, with no confirmed release date yet. After the 1.0 release, the next task will be to localize Genesis for other languages. If you would like to contribute to translating Genesis into other languages, feel free to contact Jacob Cook directly . Reports about bugs are welcome on GitHub .